Peter Flemming is a Canadian artist based in Montréal. His work makes use of improvisational kinetics and intuitive electronics, most recently exploring the idea of resonance through electromagnetically activated materials, mechanical performers and makeshift amplification devices. In 2012, variations of Instrumentation, a situational sound installation, toured internationally, notably in the first Montréal International Biennial of Digital Art, the monumental Emergências exhibition (Portugal) and the highly regarded Meta.morf, Biennale for Art in Technology (Norway). Past work has included lazy machines, solar powered artwork and hypnotically repetitive automata. He has exhibited extensively internationally and been the recipient of numerous grants and residencies. In 2013 he was long-listed for the Sobey Art award for Québec. 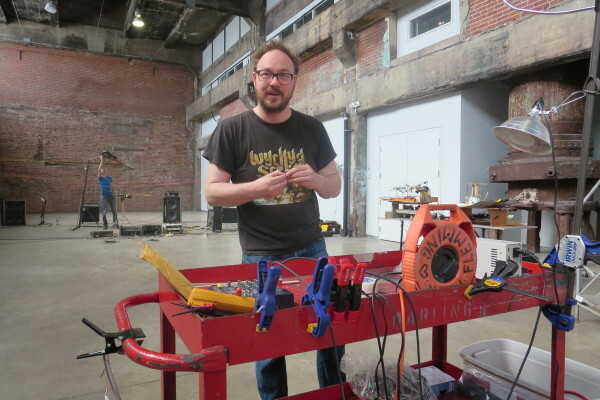 Flemming is a prolific educator, teaching creative electronics at institutions across Canada and in workshops internationally, as both an extension of his art practice and as a hands-on method of critically understanding technology. He studied under Norman White at the Ontario College of Art in the 90s and completed his MFA at the Nova Scotia College of Art & Design in 2001, where he taught their first ever Electronics For Artists course, effectively establishing a unique school of thought and influencing subsequent generations of emerging artists. In 2003 he moved to Calgary, founding the electronics lab and associated curriculum at the Alberta College of Art & Design. As of 2005, he teaches at Concordia University in Montréal.